It seemed absurd, but one precisely thrown stone altered the lives of God’s people. In the same way, micro-finance puts small amounts of money, basic financial skills, and opportunities into people’s hands to slowly overcome poverty’s grip. Philistines filled the landscape, but Goliath commanded attention. He possessed strength and tenacity no Israelite could match. “For forty days the Philistine came forward and took his stand, morning and evening.” (1 Sam 17:16). Goliath was unmovable. What could be done? Thousands of years later, Casey Steckling looked over Zambia’s landscape. A giant commanded his attention. It wasn’t an eight-foot gold-plated warrior, but the overwhelming presence of poverty. Its influence clamped down on everything, mocking God’s desire for people to thrive. 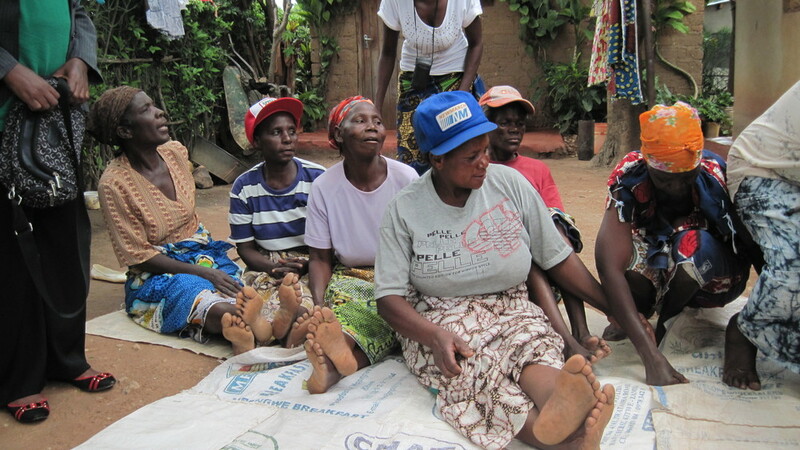 “We sat in a one room “shelter” in Kitwe, Zambia. It had no windows or frames, and only a single corrugated metal roof.” Outside, malnourished children wandered on dirt paths alongside streams of sewage. Questions filled Casey’s mind as flies filled the room. “Why did God show me this?” He was unprepared for the stranglehold of poverty. It appeared unmovable. Its presence too large and resolve too fierce. As with Goliath, the battle seemed over before it started. Casey returned conflicted and discontent. He wanted more for these people. Poverty is complex. It’s a big problem, but God loves stories when the problem seems too big. As Goliath mocked Israel’s God, an unarmed shepherd took the field. David, with no sword, carried five smooth stones. What could small stones do to Goliath’s unmovable presence? Casey asked similar questions about Zambia. What could he offer? An answer came from a different country. In November 2011, Casey flew to India to spend time with a ministry called TENT. TENT equips indigenous believers in micro business, micro finance, and evangelism. He wanted to learn how they were teaching the Dalit people group micro-finance strategies. How could something with the prefix “micro” do anything about the massive problem of poverty? It begins with micro savings. A group contributes small amounts to a fund. As the amount grows, one or more of the members take a small loan, with minimal interest. This is a micro-loan or, “micro-lending”. The money is used for groceries, bills, or educational needs. The crux of this model is when a loan is used to start a small micro-enterprise: a small garden, car detailing, haircuts, or buying and selling relevant goods. These small entrepreneurial advances are more than mere job creation. It’s momentum toward sustainability. The Dalit people embodied this narrative. “I was witness to the glory of God displayed as uneducated people managed finances, learned how to read and write, as well as give their families the chance to go to school to have real opportunities for the first time in their lives,” said Casey. He and others took this back to Zambia to put these small stones in the hands of the people. One of them was Pastor Victor, who serves in Kitwe, Zambia with those shunned because they live with HIV. Pastor Victor received this strategy and ran with it. Now, these vulnerable people are beginning to flourish as they start businesses, feed their children better meals, and attend school. Poverty’s mockery has grown quieter. After reaching for a small stone, David hurled it at Goliath and the giant disappeared from view. He had been conquered. It seemed absurd, but one precisely thrown stone altered the lives of God’s people. In the same way, micro-finance puts small amounts of money, basic financial skills, and opportunities into people’s hands to slowly overcome poverty’s grip. Here in Dayton, Casey’s house church uses micro-finance to minister to their community. They’ve developed relationships with those in poverty, including mental health agencies in Dayton who have a vast network of clients who can benefit. House churches can easily take part. Contribute a small amount weekly, roughly $5, into a fund. Use those funds to meet the needs within the group first, and then pray to be led to those within the neighborhood in need. It won’t come without relationship. These relationships become natural venues for the gospel, “the greatest and most powerful empowerment vehicle ever been offered to the world.” Micro-finance creates opportunities to engage your community with relief, relationship, and the gospel. All this comes from a few small stones. A few stones don’t seem like much against a giant, but like David, we know God is sovereign over our small smooth stones.